In 2011, a journey began. It started with an experience during the Vancouver 2010 Olympics, that caused me to reflect on what it means to be a Canadian. From this a series of paintings emerged, the project became known as #ICONICCANUCK. These paintings extended my connections with people, I found myself painting athletes for Canadian Tire Jumpstart in Toronto and Canada’s Sports Hall of Fame in Calgary. These events allowed me to interact with more people, from all corners of Canada and continue the discussion. My journey then led to a solo showing of these paintings in Edmonton in December 2013. In 2014, I launched a parallel project inspired by the conversations I was having with Canadians, the project became known as ‘The People of Canada Portrait Project’ , in which Canadians submit their best Canadian ‘selfie’ and I paint their portrait. Fast forward to 2016; the photos keep coming in and my journey across the Canadian landscape continues. This year I connected with people on the ground in Yellowknife, Winnipeg, Vancouver, Torono, Montreal and Ottawa. Through these experiences I had even more discussion and it is the people I met, in person and on-line, who set me on a deeper journey questioning, who are the People of Canada? Whether born, immigrated to, or ex-patriot, I want to know you, the People of Canada. In November I received an email from singer, songwriter, and storyteller, Christa Couture, (Associate Producer for CBC Canada 2017) and the result is this lovely article, shining a light on the project. 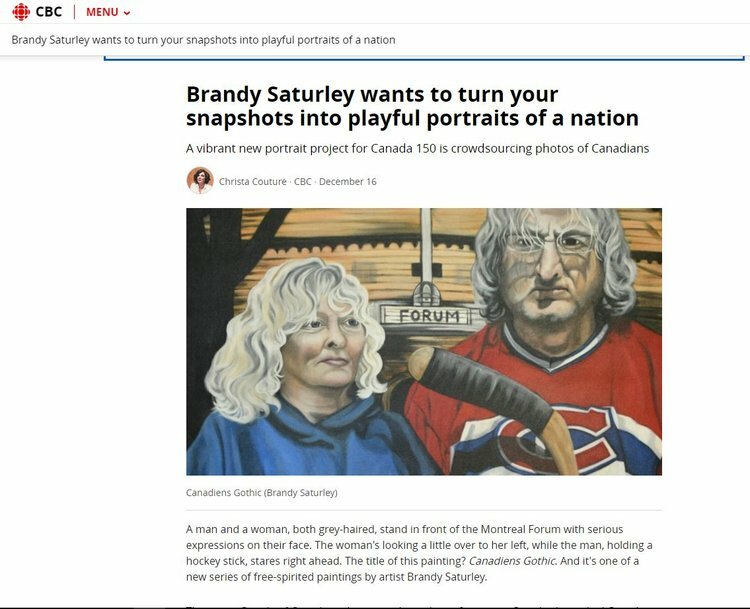 “Enticed by the power of portraiture, Saturley wants to explore and showcase the rich diversity of Canadians through focusing on the relationships we have. When choosing which photo submissions to turn into paintings, she asks the subjects a series of questions.” READ THE FULL ARTICLE HERE. Brandy Saturley talks with Christa Couture for the CBC.